The tourism market in Kenya is quite competitive, and cheap flights to Nairobi can be found relatively easy. Here are my six tips to get the best deal. So don't let the distance to Kenya stop you from planning an exotic vacation. 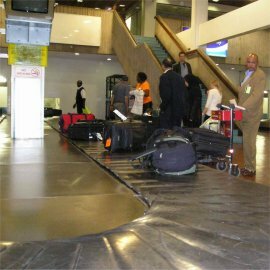 The basics about air connections to Nairobi – including a list of all air companies who fly there - are on my flights to Nairobi page. Tourism to Kenya has been growing for years and the sector is very competitive. So it pays off to shop around for cheaps flights to Nairobi. Start your search early, compare rates, play around with the dates if your schedule is flexible, and try alternative routs to get cheap flights to Nairobi. I especially use two search sites to find the lowest air fares to Nairobi. Kayak.com searches 140+ travel sites for the lowest air fares in just moments. It gathers and brings back data from all the big travel sites and networks, such as Expedia, Orbitz and Travelocity, so you don't have to lose hours visiting all these sites yourself. Vayama.com is especially of use for travelers to and from the US or Western Europe. Vayama instantly collects data from more than 100 airline sites and, on average, brings back more flights to Nairobi than any other site. Both have plenty of flights to Nairobi. There are few, if any, direct air connections from North America (as well as Australia) to Kenya. From the US or Canada, you will usually have to go past one of the European hubs (often London, Amsterdam, Brussels or Zurich). Because of this, you can sometimes save money buy booking separate flights: a cheap flight to your European hub (for which there are many options), and from there the best deal you can find to Kenya. Use Kayak.com and/or Vayama.com to find them. One of the best ways to get cheap flights to Nairobi, is to book a chartered tour. By buying up multiple seats at a time, the tour company gets a better price, which can mean savings for you. These deals often include accommodation, but it won’t be the first time that together they are cheaper than a regular flight-only. And you are of course not obliged to use the accommodation, so if you don’t like it, you just move into another place. Some charters don’t fly to Nairobi, but directly to Kenya’s second city Mombasa (at the coast, where the popular beach resorts are). Even if Nairobi is your destination, it can pay off fly over Mombasa and from there to Nairobi. Four companies fly between these cities: Kenya Airways, Air Kenya, Mombasa Air Safaris or Safarilink. There’s also a night train (taking about 9 hours) and a very cheap bus connection between Mombasa-Nairobi. The main Kenyan carrier, Kenya Airways, has joint ventures with among others KLM, Air France and Northwest Airlines. It’s part of the Flying Blue program of KLM, Air France, Delta Airlines, Continental Airlines, , Northwest Airlines, CZA Czech Airlines, Aeromexico, Alitalia and Korean Air. If you travel with them, you are awarded air miles. As you reach higher levels, you can get better deals with tickets and hotel nights, free upgrades, better service etc. Dutch KLM has daily flights to Nairobi in a joint venture with Kenya Airways, and Amsterdam is a hub both for North American and European air travelers. If you plan to visit Kenya as part of a much larger trip, then a round-the-world (RTW) ticket may be best for you. With this, you only have to book the first outbound flight now, and then book other flights as you go within a period of either 6 or 12 months. There are conditions for RTW tickets and you’ll have to do quite some research. Some RTW tickets are mileage based, while others allow you a certain number of flights (within a minimum and maximum) or set clear time limits. You can typically only book flights from companies who are part of an alliance or network (i.e. the Star Alliance in which 19 air companies take part). You often can only travel in one direction (east or west) and the final destination has to be your point of departure. Ticket prices go up in the tourist seasons, which for Kenya are July-August and December-January. You'll increase your chances for getting cheap flights to Nairobi if you look outside tourist high seasons. Prices of accommodation are lower then, too. You’ll typically pay less if you include a weekend day, because if you don’t the airlines assume you’re a business traveller who doesn’t mind the costs. But while, including a weekend day IN your itinerary, you should avoid flying on Fridays, Saturdays or Sundays (i.e. the typical days on which working people leave on a holiday, and return). It’s busier then and prices go up. Also, choose a flight that leaves extremely early, or late in the evening. Less convenience means lower fares. Another timing consideration is when you buy your ticket. Prices tend to go up as you approach the departure date, so cheap flights to Nairobi must be booked early.